Just a quick update as I tinker with a few details. I decided that I quite liked the gun vents in the Eduard set so I thought I'd put them on in place of the plastic representation. Whilst it looked much better it still felt I was just sticking PE on plastic when in reality a whole gun was visible underneath (just!). So with that thought nagging in my head (don't you hate it when that happens) I decided to cut open the holes where the vents would be and put a gun behind them so that you can see it through the vents. As the Revell kit doesn't come with a gun I borrowed one from an F-15 kit and a Quickboost M-61 gun muzzle to finish it off. Mostly you will not see any of the detail so I've kept the gun barrels quite bright for some contrast. I've also added some plasticard to try and make the gun fairing a bit more rounded as the Revell offering is a bit square. The gun is held with blue tack at the moment but I'll fix it more permanently when I've finished tinkering with the gun fairing and added the vents. Next up, the inlet at the front and base of the fin. No one seems to know what it's for but its certainly got a hole in it which the Revell kit doesn't and the kit version is a bit clunky too. I toyed with the idea of just leaving it as I wasn't sure whether I'd make a hash of it and regret removing it in the first place. But then a bought of AMS seized me and I cut the inlet off the kit. Well now it had to be fixed though it took two goes to get the proportions right. However, the result I think looks better. Right, back to the wiring diagram. Well after a little holiday in sunnier places I've managed to get the project moving again although rate of progress is not likely to be described as 'olympian'. A lot of time has been spent trying to get the surface finish right as this is an area I have traditionally paid scant attention to only to have to revisit it much later after the first few paint layers have highlighted all the work I should have done. With a model this size there is a lot of areas where attention is demanded, at least when I build them there is. Wiring in the front section is more or less complete with the cockpit fibre optics all grouped to their respective LED and the wander lamp LEDs correctly routed. That all adds up to a lot of wires which now have to join up to the rear section. 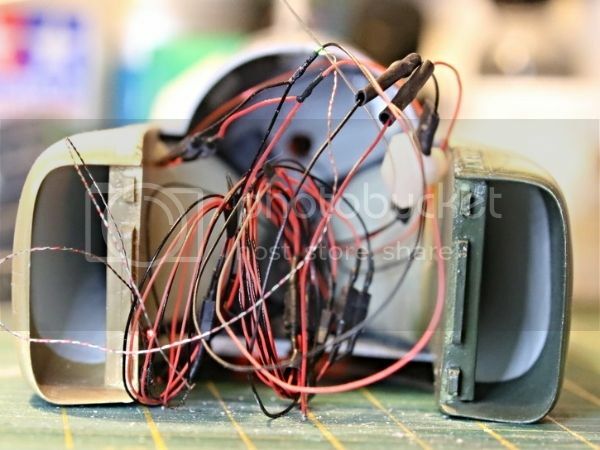 This contains the wiring for the tail, wing tips and engines. The following picture shows how I have faithfully replicated the endless wiring looms contained in the F-4. Ok so maybe not as many but it sure feels like it at times! 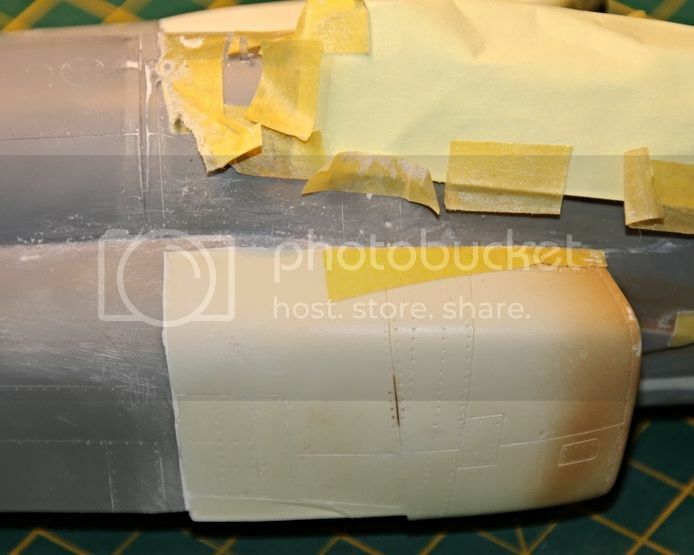 As you can see I've painted the internal intake trunks and attached them to the rear fuselage in anticipation of mating it to the front cockpit. I had to fit the engine LEDs prior to doing this and its a tight fit so luckily they were still working when I'd finished. I've also had to cut some of the bottom of the internal fuselage structure to allow the resin intakes to flex and hopefully fit the front fuselage perfectly... we'll see! Whilst fiddling with the wiring I've also had the opportunity to have a go at creating some 3D vents using thin strips of styrene spaced by small blocks to simulate the vanes. I've had to thin the fuselage walls where they join to attempt scale thickness but beware of using too much glue as the thin plastic melts easily! You can also see the magnetic strip I've added to the nosewheel area which will allow the nosewheel door to clip on and off and provide access to the LED batteries. Hopefully I can start to stick this thing together soon! First up is the requirement to fit a belly strap. Apparently all F-4Es fitted with slats had this mod up to the point where it became an internal mod (thicker skinned airframes). This occurred at some point in the FY70's build aircraft but since the ones I'm interested in are all FY 60's with slats, I needed to add one. Happily GT Resin have designed one out of, well, resin which certainly looks the part with some great detail. Instructions of how to add are a little vague and seen to show a pre-production variant that had a different profile at the end of the â€˜arms'. You need to be careful when separating the items as they are quite delicate. Not sure of how thick they actually so I sanded them all a bit thinner to avoid that â€˜made from girders' look. Error #7 Don't sand to hard or the resin arms will break into 3 pieces and require some finesse to align them again â€“ guess how I found that out. 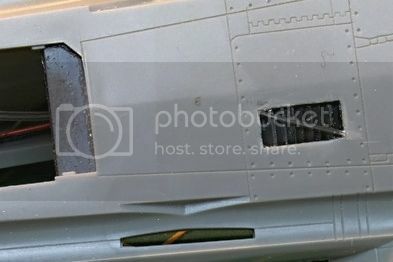 http://www.arcforums.com/forums/air/index.php?showtopic=224033&st=0 or look under "1/32 Tamiya F-4E post-Vietnam- Kicked up a notch"
which has tons or reference detail and a superb build of the Tamiya kit into a Ramstein bird. Kudos to Chuck for his efforts but I don't think I'll be matching that degree of sophistication! 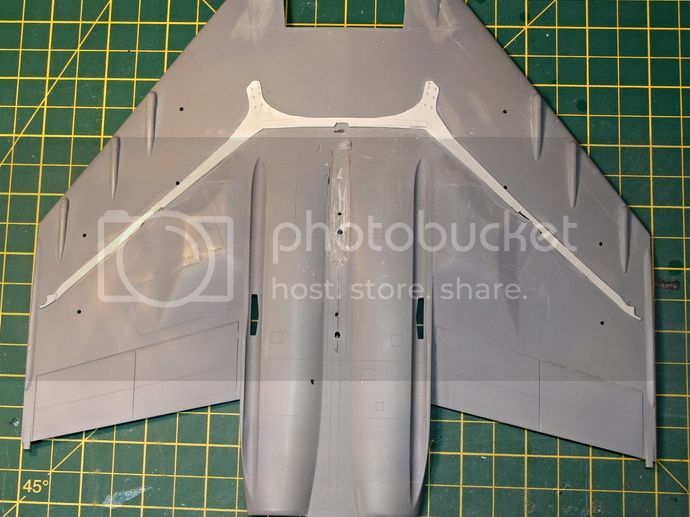 Anyway I chopped some resin from the arms and after a few test fits realised that they were a little short hence the gap filling between them and the main fuselage brace. 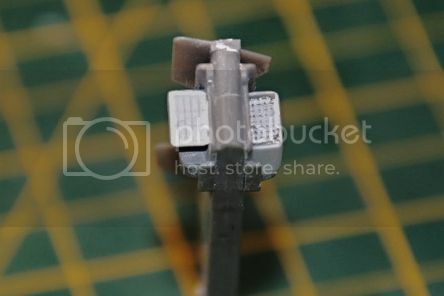 You will also note that I have butchered (a bit) the area where Revell placed a rather large lump of plastic so I can fit the redesigned Royal fuel tank mount albeit I had to move the fuel tank mounting pin holes back a couple of mm so that the tank would not overlap the belly strap (and it looks more accurate now). On that note I will attempt to add the detail of the sway braces but I've yet to add the holes for the forward braces or construct the fin holding points. I've also glued the landing gear shut (no going back now!). The fit was not bad with only a little gap filling to be done in one area. You may also spot thay I've filled in the rear Sparrow recesses as they are in completely the wrong place and are quite visible. The front ones are wrong too but the Sparrow missile covers them well after you've cut the top fin off. The final area that will require some attention (on this part) is the fact that the Revell inner pylons are located too far out (apparently). I could have left it but since I'm adding some chaff and flare pods to the pylons they will need positioning correctly or look like they will interfere with the landing gear. I seem to have added more work than I've just completed! Talking of more work, its time for the tricky bit (well one of the tricky bits that's most likely to cause me a problem at some point!). 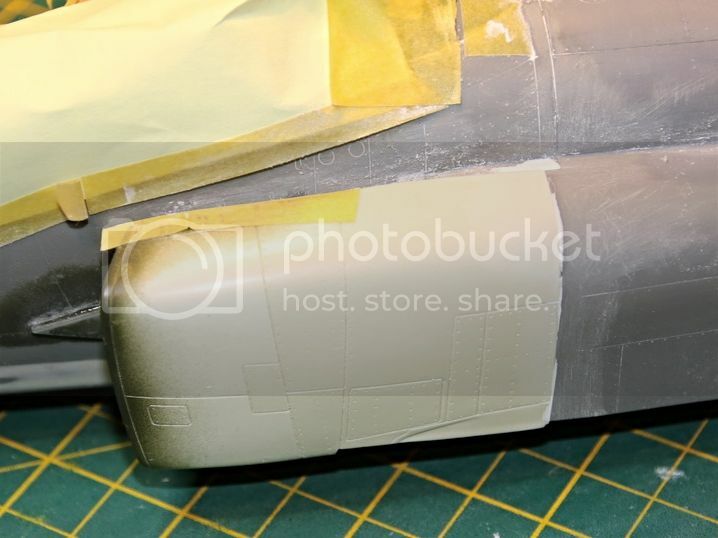 I wasn't sure when to join the front to the rear fuselage as the join is not very strong having cut a lot of the front fuselage away to fit the intakes and I had the issue of fitting the lighting around all of that. In the end I fitted the intakes first to allow enough space to fit the lighting as I knew the intakes would need a lot of CA glue and didn't want to turn my delicate wiring looms into concrete. I first glued together the join between the fuselage halves then reinforced them with 3 cross beams as the front of this aircraft is now very heavy. 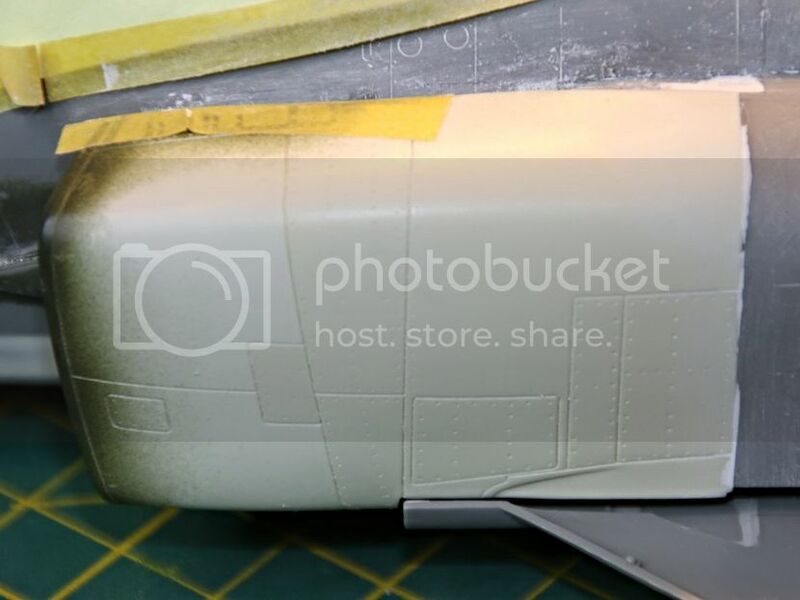 The resin intakes now required gluing to the fuselage sides which took A LOT of CA and holding pressure to ensure a solid join but it seems to have worked out ok. I now have a reasonable join up but its going to take quite a bit of sanding to get a smooth profile (with all the implied rescribing etc). Excuse the rather rough finish but there has been a fair amount of sanding to smooth out the joins, nothing that hours of laborious circling motion cant get rid of. Then the potential issue that had been sitting at the back of my mind reappeared. When I trial-fitted the under fuselage part the concerns I had raised at the beginning of this WiP came to fruition. The Revell part is wider at the join to the intake trunks than the GT Resin intakes or at least the way I've fitted them has made it that way. The wing join appears to be there or there-abouts so thankfully I only have to fix the fwd part, though I'm not sure exactly how I'm going to do that yet. I did a quick check of the Revell intake width compared to the resin parts and other resin intakes I have in stock, don't ask me how I ended up with so many makes of intake trunking! 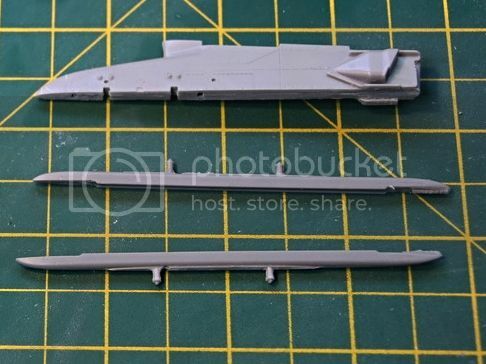 The Revell kit intake is about 19.9 mm wide at the offending join to the rear fuselage whilst the Tamiya kit is about 19.2mm wide. The SH intake for Revell is 20.0 mm wide and for Tamiya is 19.3mm wide. The Rhino intake for Tamiya is 19.2mm and the DMold about 18.9 mm. Now the crux, the GT Resin one is 19.1 mm wide. I suspect the GT Resin version I have is sized more for the Tamiya kit (although mine clearly says for Revell) but I don't have a GT Resin one for Tamiya to compare. By my Maths I have about 0.8 mm either side to make go away which is easy but without anyone knowing is going to be far harder. Note also the panel lines don't quite match up which is adding to the fun. 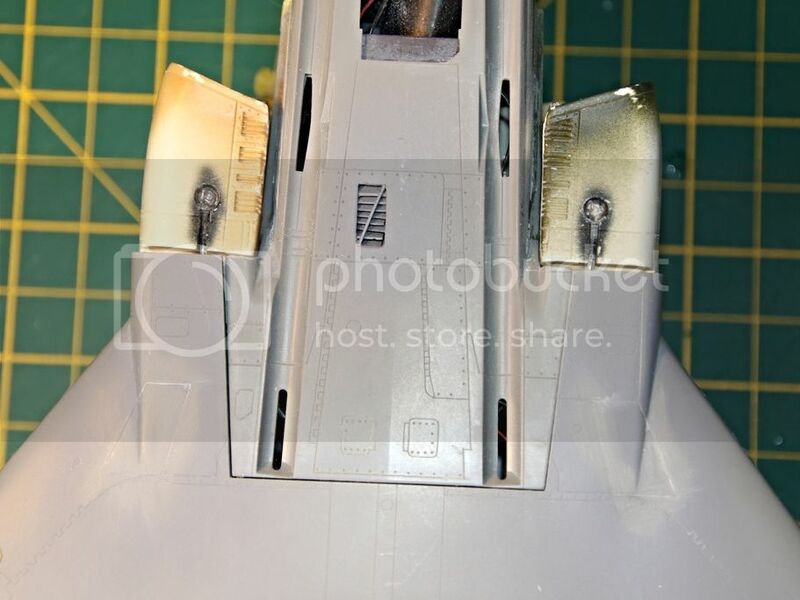 On this view you can also see the fibre optics leading to the under intake lights which is currently making the gap between Revell part and intake wider than it should be. Ah well I guess that's more fixing to be done. Plastic modelling, the joy that just keeps on giving! Whilst I contemplated the intake issue I decided to finish off the tail area. 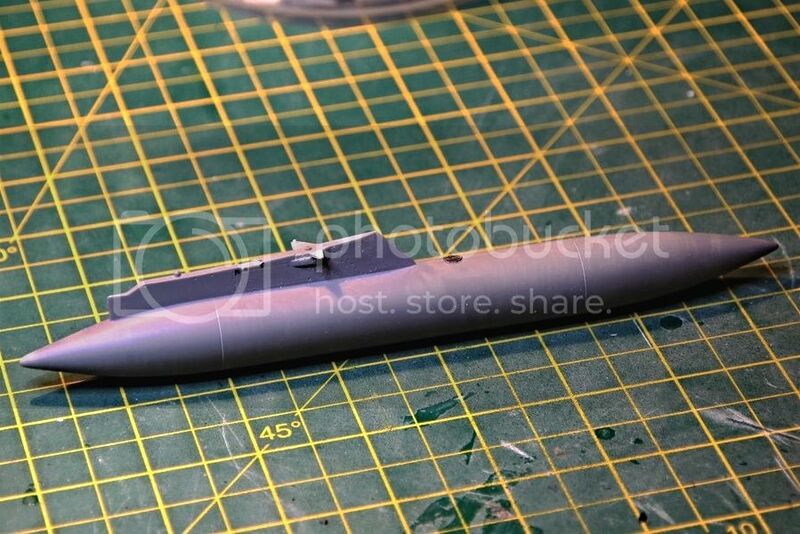 As discussed previously I've amended the intake at the base of the fin but also replaced the fin top with one scavenged from a Tamiya kit which was a much better shape and more accurate for the version I have in mind. It fits relatively well but the thickness is slightly different so a fair bit of sanding later I had a corrected profile. I also had to drill out some fibre optics for the tail light and another hole for the anti-collision LED light at the front of the tail. 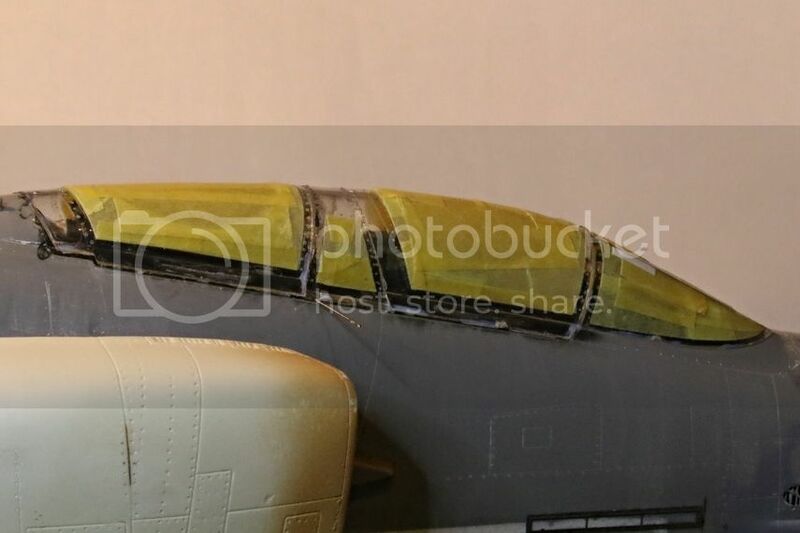 However when I glued the fuselages together the fin appeared to be warped with a curl to one side, so a bowl of hot water later and it was straightened to satisfactory condition. 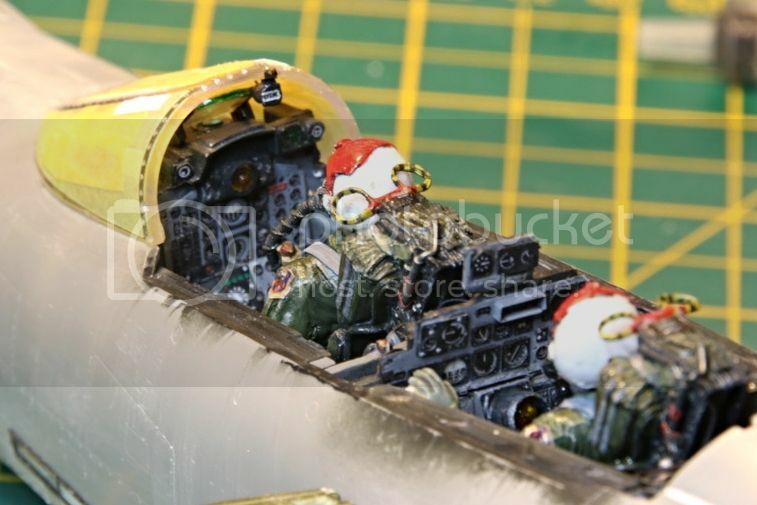 Luckily I hadn't ruined any of the electrical work as there was no way to prise open the fuselage anymore with all the reinforcements I've added! Some re-riveting later and a coat of primer helped blend all the work in. I've also added the replacement fuel dump after I broke and lost the kit one. A bit more finessing to do but it looks ok. The last bit of work was around fitting the tail slime lights. The position is somewhat critical as the tail letters overlap the light and since I was using Eduard PE rather than decals I would need to put the PE on first. To help the alignment I used two paper templates the same size as the tail letters and using as much photo evidence as I could find tried to align the templates and the slime light in their correct place. The other side required even more jiggery pokery as it had to be the mirror image of the first one. I tweaked the positions a little more after the photo was taken but only when the decals finally go on will I know if I've nailed it or not! PS Gluing PE is one of my least favourite jobs as inevitably the PE piece would rather stick to me or orientate itself anyway but straight or pretend to be stuck or bend where it shouldn't or .... well you get the picture! Well it's been a while...! So in a general advance by tinkering kind of way we have moved on a little. First up I spent a lot of time deciding whether to move the wing pylons. Apparently the inboard ones are in the wrong place which I can sort of see. What struck me more was that the outboard ones are also wrong, they are too far outboard. 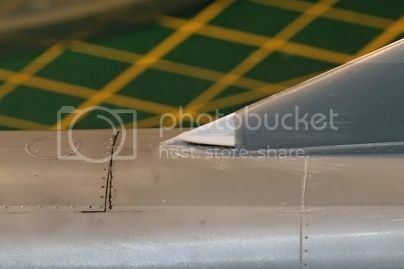 If you have a look at any head on shot with wing tanks on you will see that the tank and pylon are nearer the middle slat actuator (on a slatted version!) than the outboard one. So with a bit of guesstimate and TLAR (that looks about right) I drilled some new holes. Having done that I then went to work on the fuel tanks. 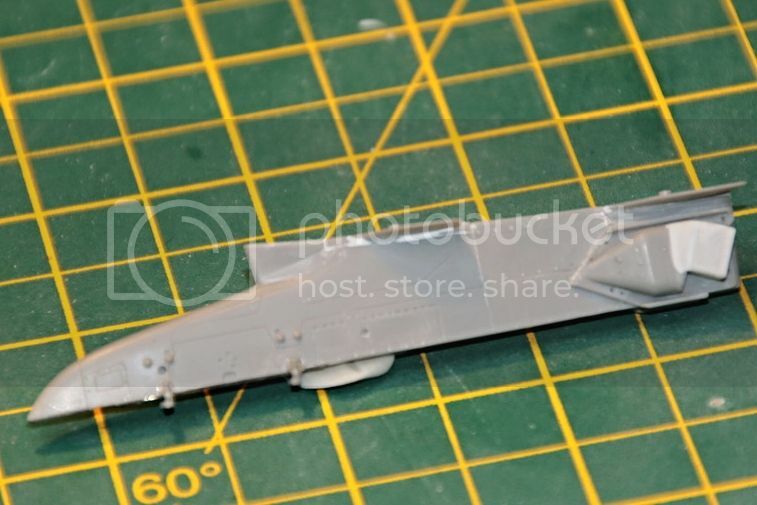 The Revell ones are a bit pointy so I smoothed off the back end. I also redid the sway brace bolts and added some PE though I'm not sure if it will be a keeper yet. I also had to cut out a small channel in the top of the pylon to fit over the belly strap. Finally I'm experimenting with 'roughing up' the surface texture as these things were rarely kept pristine and looked like they got banged around a bit. Some swipes with a curved blade provided the necessary effect. Although you can't see it that well you can feel it when you rub your fingers over it so I'm hoping the effect will be noticeable but subtle. Time will tell! Next up are the pylons themselves which need a bit of jazzing up and changing from a Lau-7 (German F-4F with Aim9L) to a Lau-3 (USAFE F-4E with Aim-9J) sidewinder launch rail as the Lau7s are too long. I also want to add chaff and flare dispensers which don't come in the kit so I will have to scratch build those. Not sure how that little snag is going to resolve itself yet! PS does anyone else have the same issues with photobucket where it absolutely refuses at random to copy across any of the edit changes you make to a photo? Having splashed out on a set of Cutting Edge Aim-9J/Ps and having them shipped over from the US of A, it was then a question of how many to load up. I must admit I was slightly reluctant at the thought of having to load all four in a one'r and I toyed with the idea of just putting one on as a training round. Unfortunately I also want to put some Aim-7s on her so a trg an Op warload mix would not be appropriate. I've used wire to hold weapons on before with come success put I liked the idea of swapping weaponry between models so I wouldn't have to buy so many expensive missile sets (you should see by F-4 stash!). I've recently played with magnets for holding doors closed when you need access for lighting kit ie battery changes, so I thought about using magnets to hold the weapons on the pylons. They'd have to be really small so as not to be too obvious and the rails and missile bodies are quite thin. 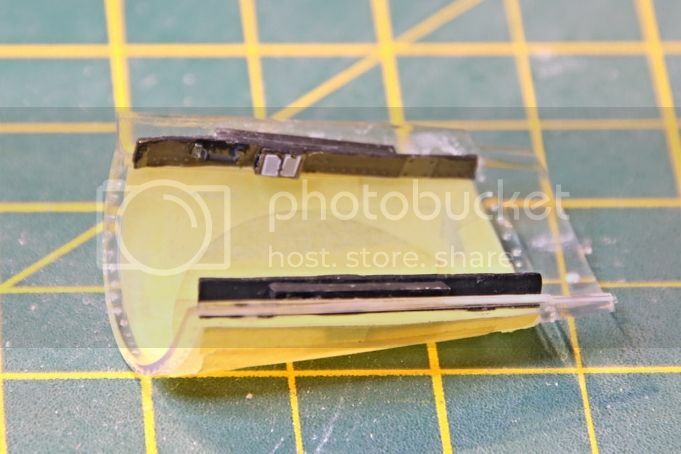 Luckily there are a few companies that do them that small and I went for the smallest I could find 1mm diameter by 1mm deep (now that's tiny!). At that size you need to use magnets in the missile and the rail so lining them up is a bit of a bugger. But having trailed it with one missile it seems to work fine and with 4 magnets they will easily hold the missile in place. This means I can remove the missile as often as I like, leave the rails without any holes or wires in them and use the missile on other models if I feel the need. 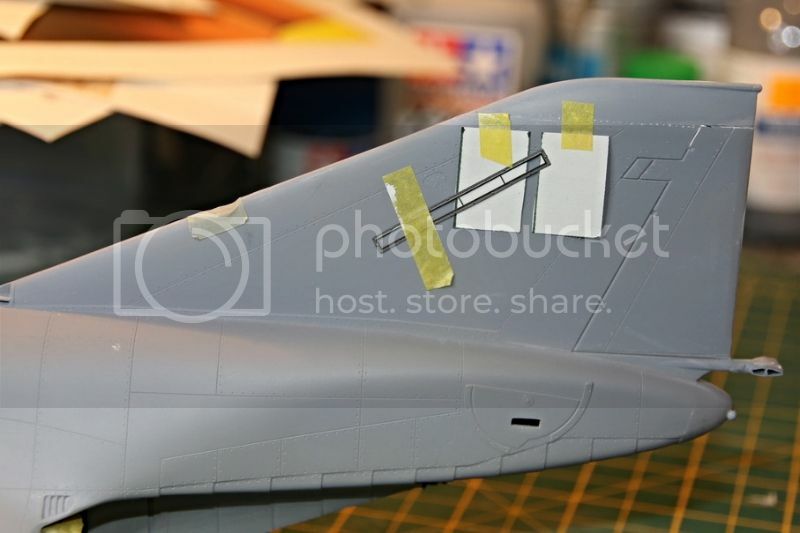 PS The Cutting Edge Sidewinders are great but the instructions are minimal and I have no idea how you use the included aligning tool to match the front and rear fins. I had to draw additional lines for the front fins and use internet references for location as there are no locating pins! Well I've finally got somewhere with the inner pylons. After some consternation over scratchbuilding the chaff and flare dispensers an ebay company from Russia - AMUR Reaver - came to the rescue with some 1/32 resin casts. They are great detail and well beyond my abilities to recreate but they are not the F-4 variety. 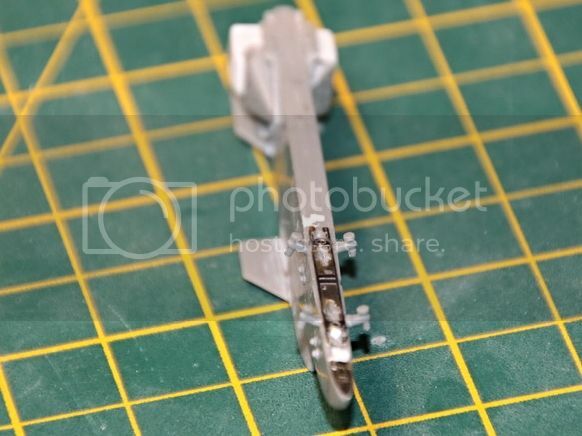 However, whilst the Chaff dispenser can be cut down to the right proportions, the flare dispenser is just the wrong configuration to fit the Revell kit. So in the end I succumbed and scratch built the flare dispenser using plasticard and some grid mesh that looks about the right size. As you can see I've had to fair the dispensers onto the Revell Pylon. I've also cut down the winder pylon to make it more like an Aero-3 launch rail. The small dots on the rail are magnets that hold the missile on. 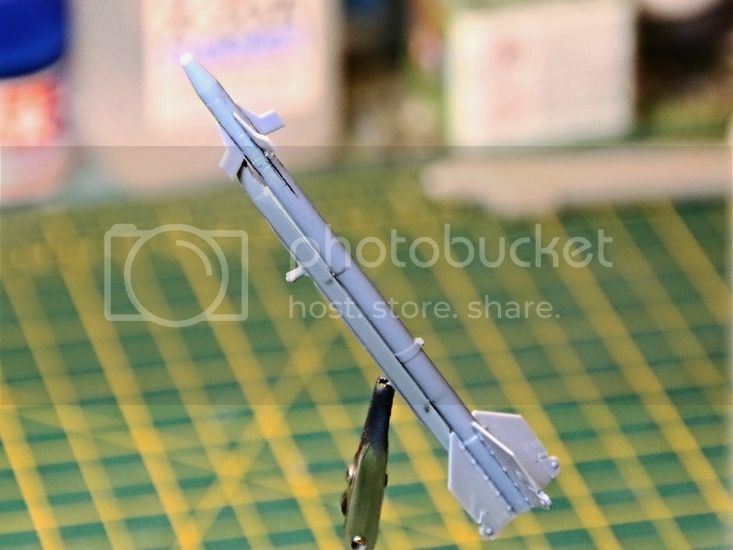 This was the first test and although they held the resin missile fine I uprated them slightly to longer magnets so that I could move the missile backwards or forwards a bit if I goofed the magnet placement on the missile. Again the dispenser needs a bit of fairing in. Error# 7 - My original attempt had the flare dispensers pointing straight back but from photos it would appear they are angled down. Back to the drawing board on that one then. I've gone for the fully loaded look so hopefully the final result is quite passable and should look better under a coat of paint. If not I can be satisfied that its stuck well under the wing out of view so all that time and effort will be lost from sight! Final shot is of the underneath of the pylon which will have nothing attached to it so I thought I'd dress it up with some of the PE meant for the Tamiya kit. It doesn't fit but what the heck it looks better than bare plastic! Wow! Phantastic work on the F-4! 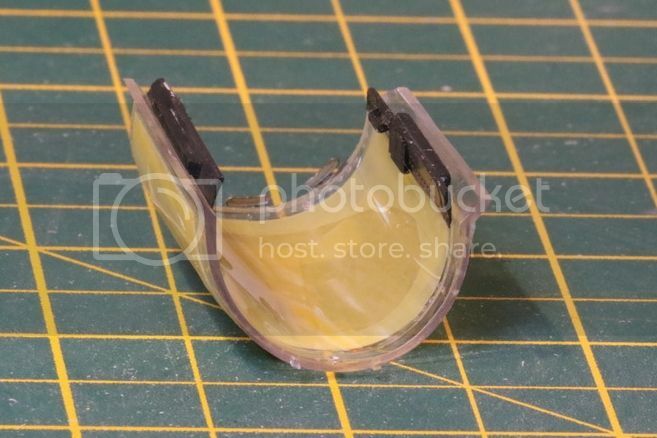 GT Resin has some really cool F-4 accessories for the Revell and Tamiya kits. I've got several of both. Look forward to seeing your progress. Meanwhile in another part of the universe.... it's canopy masking time! Which basically means the cockpit is finished, or as near to finished as it will ever be as the canopy is being glued on. You then of course have the long wait while the rest of the plane is finished before you take of the mask as see that glaring error on the other side. A truly heart stopping moment. First up is the front cockpit frame. I've added mirrors as the Revell kit has none and borrowed some Eduard PE meant for the Tamiya kit to provide some canopy framework. As the canopies will be closed it may well not be seen but I suspect something is better than nothing. I had to use some plastic rod for spacing and the PE was just about the right depth so that it wouldn't foul the correct sitting on cockpit sills. Same treatment for the rear canopy. The canopies were polished with Tamiya compounds which seemed to work very well and had the added bonus of providing some protection against the superglue required to fix the PE. A view of view of the windshield on which I've added the quite visible compass. All the frames have had an element of riveting added as the Revell canopies, though very clear, are devoid of any other detail. Then finally they whole ensemble was glued into place. No real issues though I had to use a bit of leverage to get the top of the frames in line. I suspect the cockpit frame PE was just a bit taller than I thought! Many thanks chaps, she's starting to come together at last. Just found your build....What a fantastic job you are doing! IF I may share some info on fitting the intakes it may help you or others installing them. 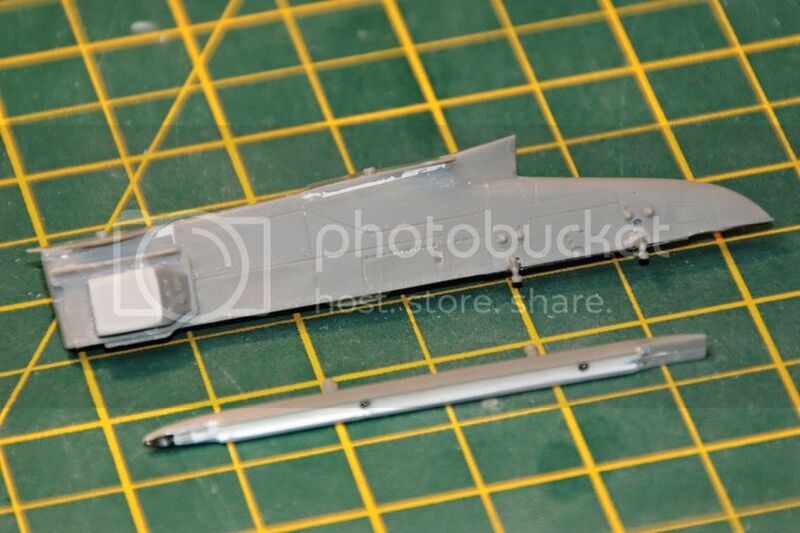 First the intakes are made to scale size based on the real airframe, not what others are making for Revell or Tamiya. 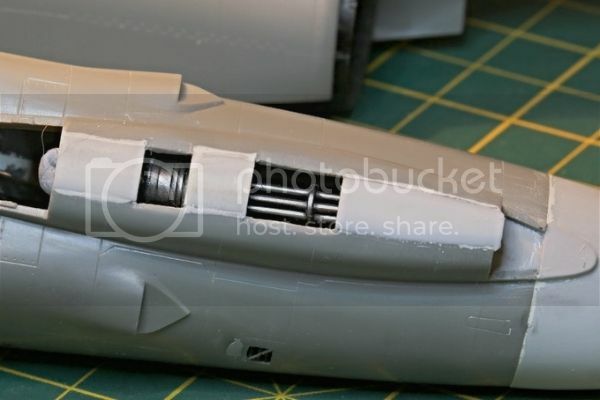 Revell made the intakes to wide and placed them to far forward on the fuselage. From your pictures you have done everything correctly with the install. 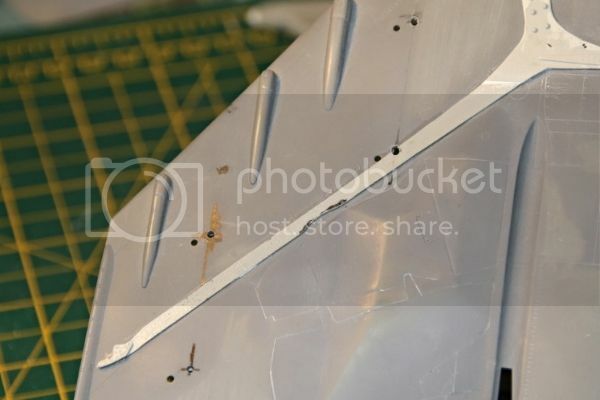 What has to be done with the Lower wing lip that is wider than the intake is to free is from the wing, trim as necessary and bend it up and glue it into place. Some filling with Ca glue or other material finishes off the area. Give this a try. Slight filling will be necessary when you install the wing top. Yes, it is a little more work than if we made it wider to fit the plastic, but the difference in appearance more than offset the additional work. Hope this helps, and I look forward to seeing the rest of the build!